The risk of stranded oil assets may be greater than many people think, writes Paul Spedding, former Global Co-Head of Oil and Gas Research at HSBC and advisor to the non-profit financial think tank Carbon Tracker, which popularised the term “carbon bubble”. According to Spedding, climate policies may well lead to a drop in demand that will leave oil reserves destined for future production stranded. The conventional wisdom regarding the recent plunge in the price of oil is that we are seeing a repeat of the 1985-1986 collapse, when Saudi Arabia ramped up production as part of a dispute with other members of the OPEC cartel. This time, the thinking goes, Saudi Arabia is doing the same in response to its loss of market share to shale-oil production in the United States. But there is another parallel that is even more relevant – with important implications for the long-term price of oil. The recent collapse is reminiscent of a similar dive in the price of coal – which crashed from a brief high of $140 a ton in 2008 to about $40 a ton today – which led some deposits to become “financially stranded,” meaning that the cost of developing them outweighs potential returns. The drop was the result of long-term environmental policies, including programs aimed at mitigating climate change, which undercut demand for coal. Efforts to improve air quality in China, US carbon and mercury emissions standards, cheaper natural gas, and growing investments in renewable energy have all eroded coal’s share of the energy market. A similar mechanism may be at work in the oil market. As pressure grows on governments to take action to combat climate change, demand for fossil fuels is likely to drop, which could result in prices remaining depressed for longer than the industry anticipates – perhaps forever. To be sure, some critics – including the British economist Dieter Helm – dismiss the possibility that assets can become stranded. They contend that the absence of serious international efforts to reduce emissions, the cyclical nature of petroleum markets, investors’ short time horizons, and the fact that most oil assets are state-owned make it unlikely that policies to mitigate climate change will have an impact on oil prices. These arguments are easily rebutted. For starters, while the international community is unlikely to agree any time soon on a global mechanism for putting a price on carbon emissions, other types of environmental policies have already had an effect on demand for oil. That is a crucial development, because even small shifts in supply or demand can cause large swings in the price of oil. The drop from $120 per barrel in 2014 to under $35 today is the result of a 2% change (roughly two million barrels a day) in the supply-demand balance. That reflects Saudi Arabia’s output increase of more than a million barrels a day, as well as mandated efficiency measures in the European Union, partly motivated by efforts to cut carbon dioxide emissions, which have contributed to a comparable drop in demand – by about 1.5% a year. Similar measures can be expected elsewhere as governments strive to meet the targets pledged under the Paris climate agreement. Second, though oil prices may be cyclical, structural changes in energy markets are likely to undermine price increases. Alternative transport technologies, including electric cars, static batteries, and hybrid solutions, are already threatening to make oil less necessary. Third, while many investors do have short time horizons, development of resources in the oil industry can easily extend to more than a decade. That means that the “safe” cash flow from today’s assets can end up invested in the next generation of high-cost assets that are at a far greater risk of stranding. Finally, the fact that many oil properties are state-owned does not protect investors who have put their money into publicly traded assets. Governments may have strategic reasons to hold onto unprofitable assets, but investors who own shares in partly privatized state firms do not. Furthermore, the first victims of any long-term price decrease will be high-cost producers, many of which are publicly traded, leaving investors more – not less – exposed. Commodity markets have repeatedly proved vulnerable to expectations that prices will fall. Given the political pressure to mitigate the impact of climate change, smart investors will be watching closely for indications of policies that will lead to a drop in demand and the possibility that their assets will become financially stranded. It is dangerous to assume that stranding can occur only over the long term. Doing so risks putting investors in the same position as the last shareholders in Peabody Energy, the world’s largest private coal company, which is teetering on the edge of bankruptcy. The fact that Peabody Energy is still operating, and thus technically not stranded, is probably of little comfort to its owners. This article was first published by Project Syndicate and republished here with permission. 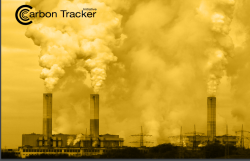 Paul Spedding is advisor to the Carbon Tracker Initiative, a London-based “independent financial think tank” which was one of the first to identify the risk of a “carbon bubble” (or “stranded assets”) and was a major force in popularising the concept. Summary for oil consumption in developed world = stagnation in better case, decline in worse case. All of these things are currently happening in the US. Coal is primarily used to generate electricity. A cheaper substitute became available…natural gas. Oil is primarily used as a transportation fuel. No cheaper substitute is available. Apples and oranges.